"Making lists has turned my life around. As a fan of Paula Rizzo's blog List Producer, I will be using her "Listful Thinking" as a daily routine to getting things done!" --Reeda Joseph, author of "Girlfriends Are Lifesavers"
"Paula Rizzo offers the antidote to the "busier than thou society" with thoughtful practical advice on how to make to do lists truly work. Her straightforward and practical approach is helpful in moving us toward managing our tasks rather than our anxiety about managing our tasks. A must have for the list maker in all of us." 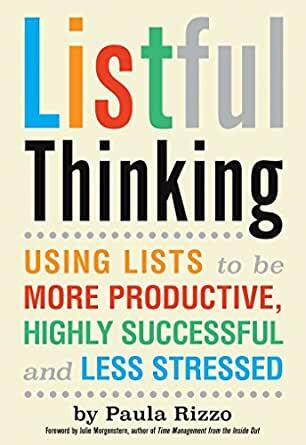 "Those of us who love making lists have been waiting for a terrific book like "Listful Thinking" to feed our obsession. It's practical, funny, and thought-provoking, and will inspire readers to use list-making themselves--both to get more done and have more fun." -Gretchen Rubin, author of the #1 New York Times and international bestseller, "The Happiness Project." "There's something so gratifying about writing out a list and scratching tasks off. "Listful Thinking" incorporates list making at work, home and play so you can be less overwhelmed and enjoy your life." --Julie Morgenstern, Productivity Expert and NY Times Bestselling Author of "Time Management From the Inside Out"
--Gretchen Rubin, author of the #1 New York Times and international bestseller "The Happiness Project"
"Making lists has turned my life around. As a fan of Paula Rizzo's blog List Producer, I will be using her "Listful Thinking" as a daily routine to getting things done!" --Reeda Joseph, author of "Girlfriends Are Lifesavers"
"Building and maintaining an "external brain" for navigating our world is critical for a sustainable lifestyle. Paula Rizzo has written a fun and useful manifesto for off-loading the job of remembering and reminding, to free up your head's bandwidth to be focused on more meaningful stuff." -David Allen International Best-Selling Author, "Getting Things Done: the Art of Stress-Free Productivity"
"Building and maintaining an 'external brain' for navigating our world is critical for a sustainable lifestyle. Paula Rizzo has written a fun and useful manifesto for off-loading the job of remembering and reminding, to free up your head's bandwidth to be focused on more meaningful stuff." --David Allen International Best-Selling Author, "Getting Things Done: the Art of Stress-Free Productivity"
"This book is a perfect for anyone who's familiar with the stress of rushing to complete things at the last minute, or becoming overwhelmed by tasks both large and small. It takes you through the practical skills of how to create lists to make life simpler no matter what you're dealing with, so if you're starting a new project or just managing the chaos of day to day life, this book will be a life saver." --Phil Parker, Expert in the Psychology of Happiness, Health & Genius, Author of "Get The Life You Love NOW"
"There aren't 25 hours in the day, but there is "Listful Thinking." I wouldn't be where I am today without my 'lists'! Optimizing time is critical to success... as a professional, a parent, and a partner. Paula's approach is like a modern checklist for getting the right things done. Her lists help to calm the frenzy and focus our energy on what's really important. You need this book!" --Ali Brown, Entrepreneur, Mentor, "AliBrown.com"
"A positive change maker!" Tara Stiles, author of "Yoga Cures"
"I was pretty positive this book was going to fit right in with my compulsive need for organization and cleanliness. Oh, was I right." -Sarah, "Return to Sender, Letters to the World"
"Until I met Paula, I thought of myself as an effective, gets-things-done woman. But compared to Paula, it seemed I was only average. Paula is sparkling, clear, energized, and focused. She's the kind of person you want in your neighborhood because she'll always know which official to call about what problem, and she'll probably have already solved the problem before you've even gone to her door to seek her counsel." "If you are a mom, this is a great book for you. If you are a student, you will get many great organizational tips from Listful Thinking that will help your grades, your study habits, and even get you an few extra hours of sleep." "With my penchant for listmaking, it seems I've found a kindred spirit in Paula Rizzo, the founder of ListProducer.com and author of the new book Listful Thinking: Using Lists to be More Productive, Highly Successful, and Less Stressed." "Rizzo, a TV producer, explains that she s a glazomaniaca person who is obsessed with making lists. Her book describes various types of lists that can help you to get organized, how to make efficient lists, and how such rosters can change your life. Mainly, she says, it s important to list everything you have to do, no matter how small. That way it s not swimming around in your head anymore and you can have a sense of accomplishment as there will be lots of things crossed off quickly. I must say, it s working for me." - Henrietta Verma, Editor, "LJ Reviews"
"I was pretty positive this book was going to fit right in with my compulsive need for organization and cleanliness. Oh, was I right. "Until I met Paula, I thought of myself as an effective, gets-things-done woman. But compared to Paula, it seemed I was only average. Paula is sparkling, clear, energized, and focused. She s the kind of person you want in your neighborhood because she ll always know which official to call about what problem, and she ll probably have already solved the problem before you ve even gone to her door to seek her counsel." "With my penchant for listmaking, it seems I ve found a kindred spirit in Paula Rizzo, the founder of ListProducer.com and author of the new book Listful Thinking: Using Lists to be More Productive, Highly Successful, and Less Stressed." David Allen International Best-Selling Author, "Getting Things Done: the Art of Stress-Free Productivity"
Phil Parker, Expert in the Psychology of Happiness, Health & Genius, Author of "Get The Life You Love NOW"
Julie Morgenstern, Productivity Expert and NY Times Bestselling Author of "Time Management From the Inside Out"
"Those of us who love making lists have been waiting for a terrific book like "Listful Thinking" to feed our obsession. It s practical, funny, and thought-provoking, and will inspire readers to use list-making themselvesboth to get more done and have more fun." Gretchen Rubin, author of the #1 New York Times and international bestseller "The Happiness Project"
"There aren't 25 hours in the day, but there is "Listful Thinking." I wouldn t be where I am today without my lists ! Optimizing time is critical to success... as a professional, a parent, and a partner. Paula's approach is like a modern checklist for getting the right things done. Her lists help to calm the frenzy and focus our energy on what's really important. You need this book! Ali Brown, Entrepreneur, Mentor, "AliBrown.com"
Reeda Joseph, author of "Girlfriends Are Lifesavers""
I found this book to be quite useless. The author natters on about how great it is to make lists and gives dozens of examples of things she makes lists of such as grocery lists (duh), gift lists, packing lists, etc. She also makes lists things seem quite silly such as things to say to a celebrity - should you ever run across one who actually wanted to be chatted up by a stranger, or a list of things to say to make people smile. If I spent all the time she does making lists I'd never have the time to actually accomplish anything. Much of the book has nothing to do with lists and is a re-hashing of organizing tips and tricks that anyone interested in time management had already heard a hundred times. The main message seemed to be, "if you have something you need to remember to do, write it down." I think I could figure that one or for myself. It also seems to me that the author misses the boat on the most effective use of lists which is a standing checklist for anything you have to do more than once. While she alludes to it and has a couple of samples, most of her examples are of one time lists. I also thought it curious that the author's most comprehensive checklist for a repeatable activity was for a destination wedding. Just how many times would one have to plan a destination wedding for themselves? Bottom line is that I found this book to be like so many of the "blog-to-book-deal" genre; light on substance, obnoxiously chatty in style, and completely lacking in originality. 5.0 out of 5 starsExcellent eBook! Highly Recommended!! I had recently bought this eBook and put it in my Kindle library to collect a bit of digital dust until I could pull it up and read it. I was feeling depressed, disorganized, mentally fuzzy, tired and unsure of what I should be doing when I thought to myself, "what one book could I read that could pull me out of this funk." This one came to mind and I read it in one day while at work (I got a lot of downtime). Right from the start my mind started feeling awake, positive, organized, clear and motivated and believe it or not, I could even see more clearer.. really. This was just what I needed to kick-start me into high gear and start making lists. The first list I made is a list of the lists I need to make. Paula did a wonderful job of organizing the information and getting right to the point..not much fluff here. She gives a lot of great resources too that will save you time and probably money as well since time is money and you could spend hours trying to find all the suggested apps she lists in this book. I rarely give 5 star reviews and I don't know this author from anywhere so this review is pure, grateful expression. If you need to get organized..get this eBook and DON'T waste any time allowing it to gather digital dust on your Amazon cloud. READ IT ASAP! I was very excited to read this book. I've been a list maker most of my life and I thought this book would help me get better at List making. It did help confirm that I'm am creating good lists and I have a good system already. But there were a couple sections in the book related to areas that I wanted to improve on but the author only hinted at them and didn't expand on at all. So I was disappointed in that regard. It's a good starting book for someone interested in upping their list making game. But some key ideas lacked expansion. LOVED THIS BOOK! Paula Rizzo has written a helpful, user-friendly guide for how to intelligently use lists to increase productivity and reduce stress. I liked a lot of great morsels in here. My personal favorite: Marissa Mayer (CEO of Yahoo and also a list-maker) hates to get to the end of her lists. Need a productivity boost? Put this book at the top of your list! This book provides a quick but detailed view into the day to day life of a master organizer. I found a dozen new ideas and “reframed” some of my own methods.